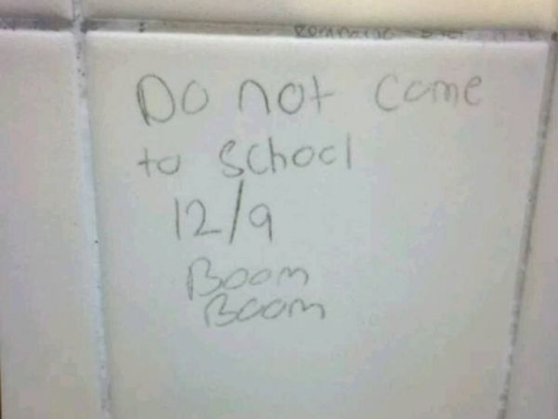 Toms River police and Ocean County Sheriff’s officers provided an extra layer of protection to students Friday after a threatening note – for the second time in several weeks – was found on a bathroom wall at Toms River High School North. Police spokesman Ralph Stocco said school staff immediately notified the police department and an investigation was initiated. Through the course of the investigation, additional information was received that there was a previous threatening message written on the same wall during the last week of November. Since this incident was first reported, specially trained K-9 units assigned by Ocean County Sheriff Michael Mastronardy conducted more than one safety search of the school on different days. On Friday, additional police officers were on the campus to provide an extra layer of security for the students and staff. David Healy, Toms River Schools Superintendent, said that any student “proven to be responsible for this act will be subject to discipline,” ranging from a suspension up to a recommendation to the board of education for expulsion. Earlier this year, two Toms River students were arrested and charged for making social media threats. “We hope to have that same level of success in putting an end to the fear generation by thoughtless students,” Stocco said.